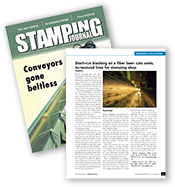 All-New Stamping is committed to manufacturing a high quality, custom precision part for every project. We want to make sure that your part meets your exact requirements, is of the highest quality and is manufactured in the most effective method. To do that, we offer a Design for Manufacturability (DFM) program. Our staff will assist you during your design process to determine the most efficient manufacturing method for your part, and identify and address any design or manufacturing issues before they become problems. We’ll take into consideration ways to reduce costs and improve throughput of your parts, while never losing sight of the high quality you have come to expect from All-New Stamping. We work with each project to ensure that it meets your specific requirements, and is manufactured using the most effective and efficient methods. At All-New Stamping, we are your manufacturing partner working with you every step of the way to provide you with the Power Satisfaction you deserve for all your projects.